3 Ways to Play Walker - Ford F-150, White is rated 1.0 out of 5 by 1. Ford and Bright Starts bring families together to put the power into playtime. 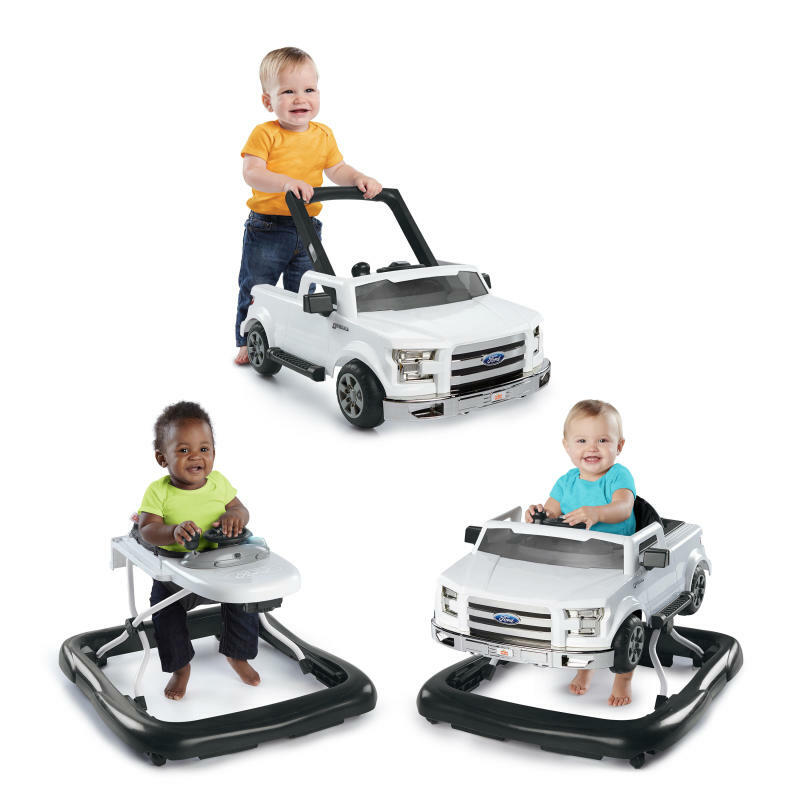 The 3 Ways to Play Walker™ - Ford F-150 is Built Ford Tough to handle baby's steps at almost any stage! This amazing 3 in 1 walker for baby supports both beginning and more experienced walkers. Two can play at once! One baby can play in normal walker mode to encourage gross motor skills and more advanced walkers can use the push-behind mode! To use in push-behind mode, simply lift the push bar and remove the truck from the walker base. Baby will "steer" right into imaginative play with the authentic truck sounds, lights, gear shifter, steering wheel and the look of this rugged Ford-tough walker. The removable steering wheel play station can be used for floor play or on the go. A high seat back provides comfort and support for baby. The design of this baby walker allows for easy fold, storage and portability. The walker can be easily kept clean by wiping it down where needed and tossing the seat cushion into the washing machine. It is safety enhanced with rubber feet that "brake" and a sturdy frame. Make the fun last even longer by adjusting the walker frame to three different height positions to keep little toes at the perfect height. Dimension (in) 28" x 25" x 20"
Seat Pad – Can be cleaned by sponging with warm water and a mild detergent. (Do not im-merse in water.) Never clean with abrasive, ammonia-based, bleach-based, or spirit-type clean-ers. Seat pad must be dried thoroughly on a flat surface before using or storing. Do not spin or tumble dry.Plastic Parts – Wipe clean with damp cloth and mild soap. Air dry. Do not immerse in water.Frame – Wipe the metal frame with a soft, clean cloth and mild soap. Rated 1 out of 5 by Stark from Toy broken Today this toy broken having my baby boy in there. Scared me a lot. I hope the use a better material when they made it.